Last week I bought a mutant Tweety Bird ice cream bar from the ice cream truck and took a photo of it. I've been fond of the ice cream truck's latest media tie-in ever since I was a child and you could get Slimer-themed misshapen things. And now that I've moved to England, I've missed them more than I thought I would. I went back to L.A. in March and, when the ice cream truck rolled around, I picked up what was called a "Darth Vader" ice cream. Berry, Fruit Punch, and Cherry Flavor with Sour Cherry gumball eyes. Great fan of the site, love random things like this. X-Entertainment article from a few years back." In frozen, edible form, Hulk comes to us simply as a giant green head with two purple gumballs acting as "eyes." Don't let the gamma-inspired color scheme fool you -- much like the terminally yellow Spongebob, Hulk also tastes like lemonade. With a painted-on scowl and a drooping brow that identifies his inner rage, the Incredible Hulk's Ice Head is a formidable foe. As for Spongebob's frosty funpop, it's a little more haphazard than Hulk, though adequately "bumpy" along the sides with two plain black gumball eyes. Black isn't a typical color even in those machine-refiller boxes, so Spongebob's eyes seem way more important than Hulk's. Still, neither will be judged on any of this. It's a dangerous game they're playing, but the rules are simple. They just gotta make sure they ain't the first to melt to death. 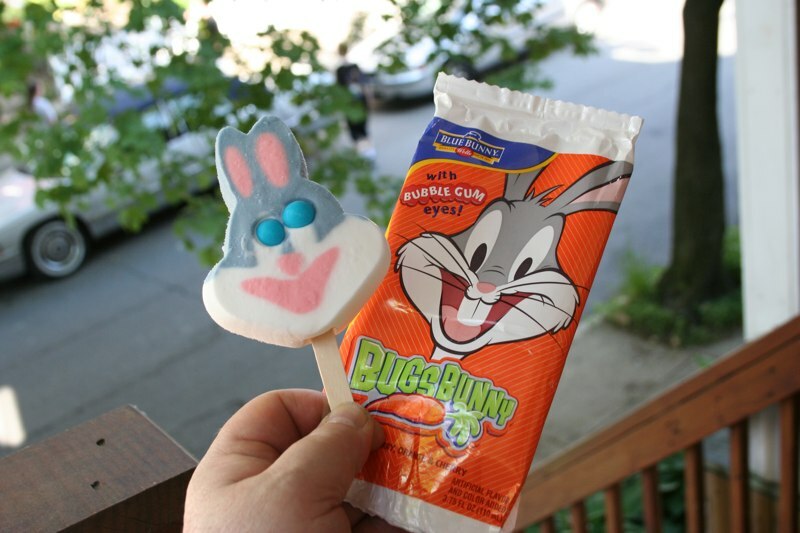 I went to the Blue Bunny website (makers of the ice cream treats Mark has bought) and they don't feature the ice-cream truck items there, but they do at their Bomb Pop website. And, according to the pictures on the website, the eyes are supposed to be centered. On behalf of those who initially thought the manufacturers were trying to emulate the Tweety wrapper, we concede.